Home Costs > How Much Does a Pole Barn Cost? Whether it is going to be used as a garage, a workshop, or for storage, a pole barn is an inexpensive way to add a shelter to your property. Pole barns can come in a variety of sizes and shapes and each one can offer different features. Pole barns are usually constructed of metal that is built on a concrete foundation. Pole barns can be built in two different ways. One popular way is by using a kit that includes all of the materials necessary in order to successfully build a pole barn. Pole barn kits can cost anywhere from $5,000 to $15,000 for a small structure (up to 8 feet walls) to as much as $10,000 to $35,000 for a larger structure (up to 14 feet walls). These kit prices will not include professional labor prices. If you need a professional to build the barn once you have purchased the kit, you should plan to pay an additional $5,000 to $10,000 to the prices noted above. If you want an exact estimate from a local, licensed contractor, consider receiving multiple quotes for free at HomeAdvisor.com. Simply describe your job and you can receive quotes in your inbox. The prices, in the end, will depend on the complexity of the design, the quality of the materials you’re using, the company you’re purchasing the kit from and if you decide to use a local contractor. If you want to budget based by the square foot, then you should be looking at $2.50 to $4.50 per square foot. CarterLumber.com has a nice calculator that you can play around with to get a good estimate. For example, a pole barn that measures 24 x 40 x 8 feet with metal siding and roofing can cost $5,000 to $7,000 for the materials alone. The price range will generally depend upon the number of doors and the size that you want. Menards also has a nice design calculator as well. According to PoleBarn.com, a 24 x 25 2-car garage can retail for $10,000, while a horse barn that measures 36 x 48 can retail for $29,000. They also note that it is safe to budget around $7.50 to $10 per square foot for the kit alone. The larger the building is, the less you may pay per square foot. HansenPoleBuildings.com, an online company that offers pole barn kits, has kits that range in price anywhere from $3,299 for a 24′ x 24′ x 8′ to as much as $31,499 for a 60′ x 120′ x 16′. Adding customizations such as carports, doors, windows, etc, can all bring the average up. FBi Buildings says the factors that go into the project cost will depend on the permit fees, building pad, finish grading, building shell, interior build-out, paving and landscaping. Check out the sample quotes we received in our table below for popular-sized pole barn kits/sizes. NOTE: The prices above will not include professional installation. To budget, add another $10,000 to $20,000+ to the prices mentioned above to give you a fairly good idea on what you may pay to have a contractor help you. Of course, adding more features, doors, windows, etc, can bring up the price quite a bit. Depending on the city where you live, a building permit will more than likely be required. If you are going to purchase a kit, some may include the shipping of the materials while others may charge for delivery. There are so many features that can be added to a pole barn such as premium siding, roofing, overhangs, large doors, entry doors, windows, and even porches. Popular options, according to DIYPoleBarns.com, includes a full-length porch, overhangs on all sides, wainscoting, a continuous ridge vent and skylight panels. Pole barns usually do not come with insulation. To add more insulation, additional charges can apply, and this can be an additional $1 to $4 per square foot. Pouring a concrete slab/flooring can cost $5 to $14 per square foot. If you want to have a professional build the kit for you, labor charges can vary anywhere from $4,000 to $10,000. This will depend on the size, the inclusions, and complexity of the barn. Since a pole barn is so basic, electrical and plumbing is not included. Adding this to your barn can considerably bring the price up. If you purchase a pole barn kit, this will include everything but the flooring. While a concrete slab can be poured, the flooring will be up to the person building it. Pole barns are very simple to construct since they only consist of wooden posts and beams which are set in concrete within the ground. Standard roofing will be made of either metal or basic shingles. 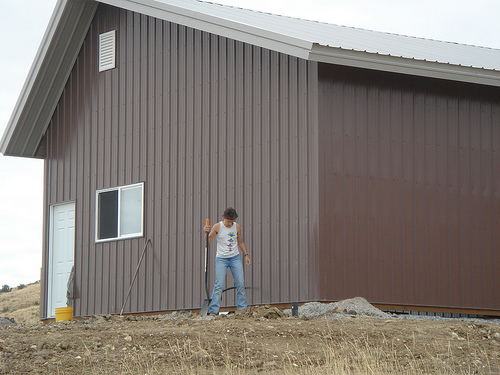 Siding can be made of either metal or vinyl. Common building width sizes can include 24, 30 and 40 feet. Common lengths can include 40, 48, 56 and 64 feet. Standard heights can include 8, 10, 12 and 14 feet. Your geographical location can play a crucial role in the price of a pole barn. Those who live in areas that commonly have strong weather conditions, such as heavy snow or hurricanes, may want to add more features as well as reinforce the structure and add to the insulation. With such a large investment, you should take your time and research all of your different options. The internet is a great way to gather information and ask for estimates. Take your time and make an educated decision. Many companies will be more than happy to provide a free consultation. Take advantage of this, especially if they are willing to come to your home. If you do not have the cash to pay up front for the pole barn, consider a home equity line on your mortgage or even consider checking out various financing options with the many companies that can offer it. Stick with the basics. Basic materials such as metal roofing will be cheaper than shingles. If you are only using the barn for storage, do not worry about anything other than the basic electricity needed for a light. The fewer windows a pole barn has, the lower the price will be. The same can be said about the size of the building. Any competent designer will be able to tell you what you can knock off the pole barn to bring down the price. If you have a set budget, let them know and see what they can do for you.